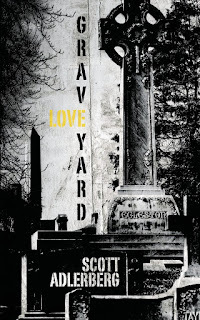 Graveyard Love, Scott Adlerberg’s creepy novel about perversion, lust and obsession, was released shortly after New Year’s this year. It could just as easily have been slated to appear the week of All Hallows’ Eve: Adlerberg’s novel is as nightmarish a tale of conspiracy, murder, abduction and imprisonment as you are likely to run into during the time when ghosts and ghouls walk the earth and human fears come to the fore. Best yet, except for a pair of eerie dead eyes that seem somehow to be watching the lead character at one point, there is nothing in the book that smacks of the supernatural. The real monsters shrouded within Adlerberg’s intricate plot are thoroughly human – and uniformly repellent to those of us who are more or less normal. Bad things happen to bad people. That’s what gives the novel its chilling allure. Kurt, the central character, is a failed writer who lives with his obnoxious, self-absorbed mother in a rural redoubt far from the city. The mother is a harridan. A chain smoker, she constantly wafts tobacco fumes in Kurt’s face. She insults his ability as a writer, demands his constant attention and radiates hostility and bitterness. 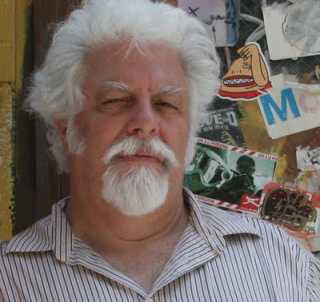 Kurt is supposed to be working on her memoirs, but the task is unfulfilling – and possibly unfulfillable: her demands on his meager skills are voracious and when he is not plunked in front of a computer, banging out her drivel, editing it repeatedly, then throwing away passages and starting from scratch, she insists on keeping minute track of his comings and goings. Adlerberg unfolds these details at an unhurried pace that makes the reader to feel his entrapment and unhappiness, in a way, forcing his audience to step into the shoes of his main character. This early pacing might drive away some readers, but those who abandon the book because it doesn’t start with a gunfight, brawl or robbery will be missing a sweet payoff later. Author Scott Adlerberg: A Fine Grasp of "The Wonder." Everything else about Kurt we end up discovering as the novel unfolds: his alcoholism, his predilection for cult horror films, his unseemly past dalliances with women. What is made clear almost immediately, however, is the fact that he is a stalker – and not a cautious one, either. The object of his current fascination – indeed, the only person who temporarily allows him to escape from his self-imposed confinement and the wretched personality of his mother – is Catherine Embers, a beautiful red-headed woman he has noticed visiting the rambling graveyard across the lane from his mother’s house. He begins watching for her and following her on her nocturnal visits. He creeps near enough to hear her sobs and moans when she is inside one of the crypts on the grounds and even buys a telescope to facilitate spying on her. Adlerberg is particularly fine at giving the reader a spine-tingling sense of the thrill Kurt derives from his clandestine espionage, the secret pleasure of violating someone’s personal space without their knowledge. “Being out in the graveyard to await the arrival of the red-haired woman, this was something new and mysterious,” Adlerberg writes about his stalker protagonist. “I could feel my heart racing. Despite the cold, my armpits were sweating. “ Two or three times a week the subject comes to the cemetery and visits a grave. “Someone she loves has died. But she never brings flowers. Never brings anything. (To me, this frission is what James Ellroy’s character, Fred Underhill, is talking about in Clandestine when he describes “The Wonder” that makes being a cop such a guilty pleasure. It’s a secret source of joy to anyone who has ever watched someone from hiding or slipped into their home when they are absent, and it is probably one of the primary attractions to those who follow the profession of spy or burglars). Kurt slowly collects bits and pieces of information about his prey and his obsession with Catherine grows. Eventually he clumsily reveals himself as her admirer, and the plot begins to move more quickly. Without spoiling the last half of the book, suffice to say that complications follow complications for Kurt and Catherine, and the novel ends with a ghoulish twist that makes it perfect bedtime reading for a stormy winter night when rain spatters the windows in sudden clumps and fingers of wind pull at shutters and shingles. This review will be that last that I produce for this blog, though I still may post occasional items about work that I have in progress, longer pieces that have been scheduled for publication or other news about my own writings. 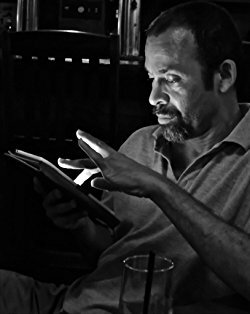 The fact is, my cancer has left me with only a fraction of my previous energy and I simply no longer have the energy to post frequently in social media, review books for this blog and post write-ups about the things I am reading. Instead I plan to spend what time I have remaining working on my own novels, novellas and short stories and trying to find homes for them. 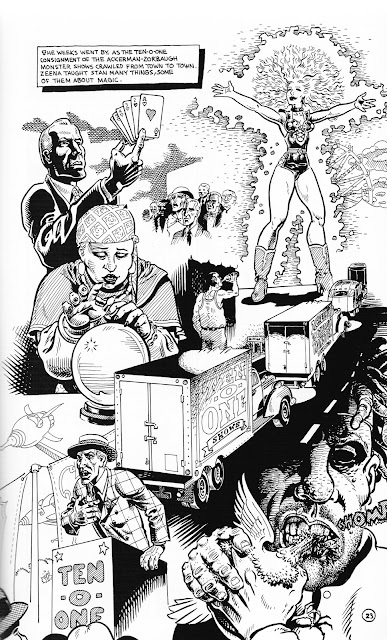 I know that I have previously raved about William Lindsay Gresham’s brilliant Nightmare Alley. This is noir of the highest quality with a wrenching twist at the end, one of the highest quality novels of its type I have been lucky enough to read. And I also know that in reviewing Gresham’s book, I praised Spain Rodriguez’s dark and creepy adaptation. But my comments were based largely on a handful of panels from the graphic novel that were available on line, as I hadn't had an opportunity to read the entire graphic adaptation. Since then I have bought a copy of Rodriguez’s rendering from a dealer in New York and had a chance to read it through. Now that I have had a chance to go through it thoroughly from cover to cover, I am even more impressed. Spain's treatment, rendered in his stark, two-fisted style (think of his most famous creation, Trashman) is more of transcription than an adaptation. The story adheres very closely to William Lindsay Gresham's original and even quotes entire sections of the original text. 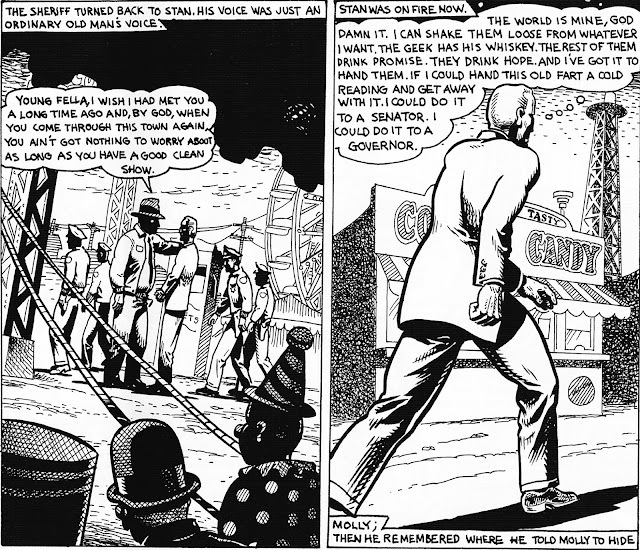 It keeps the grim, cynical tone of Gresham's masterpiece fully, right down to the last four panels, which encapsulate graphically something that is only hinted at in the original novel. But Rodriguez goes Gresham one better: he actually smooths the narrative, providing or clarifying links between the characters while maintaining the tenor and pace of Gresham's original story. In fact, in terms of clarity and maintaining the driving pace of Gresham’s novel, Rodriguez actually manages to improve on the original. 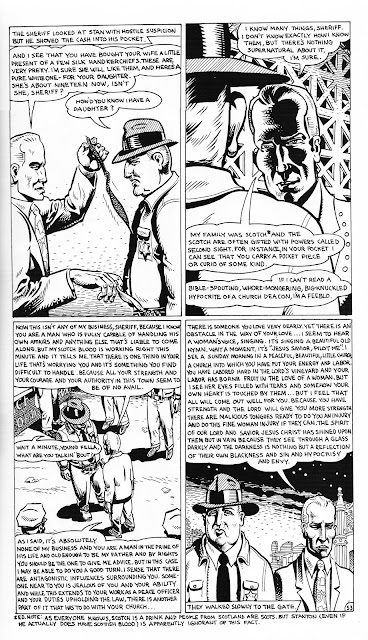 To recap, the story is essentially the journey of Stanton Carlisle from a penny-ante grifter and sleight-of-hand artist in a traveling carny to a top-billed spiritualist, all based on his skill at the “cold read,” a mentalist scam that involves picking up on vocal cues, visual clues and other minuscule pieces of evidence that allow him to “read” the sucker’s mind. Once he hits the top, things go wrong in a classic fashion and he finds himself facing fraud and assault charges. He goes on the run, eventually making his way back to the carnival and his ultimate degradation. "Ever since he was a kid, Stan had had the dream he was running down a dark alley. Far down at the end of it a light burned but there was something behind him, getting closer, until he woke up trembling and never reached the light . . . [it was his] nightmare alley." Rodriguez doesn’t simply replicate the story in his artwork; he actually punches the narrative up, and the stark chiaroscuro graphics he uses to illustrate the tale are perfect given the dark and grim nature of Gresham’s story. One of the things that makes Nightmare Alley so memorable is Gresham’s deft use of carny slang in creating his narrative and giving a voice to his characters. 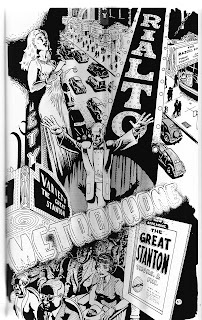 Rodriguez is faithful to Gresham’s rolling show lingo, using it throughout his adaptation, but adding a visual element to the dialog that helps the reader understand obscure and little used terms like mitt camp, rube, be cool, spook racket. 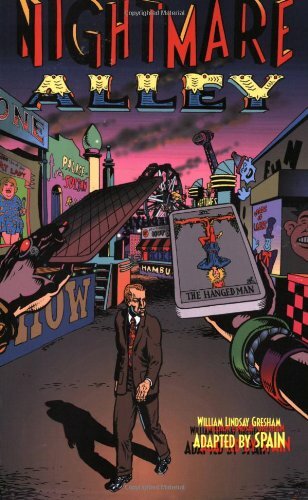 Sadly, Fantagraphic Books tells me that Spain’s Nightmare Alley is now out of print, but copies can be found for sale by collectors in a variety of locales. If you are a noir fan – or simply like a solid piece of graphic story-telling – you should add this to your library.